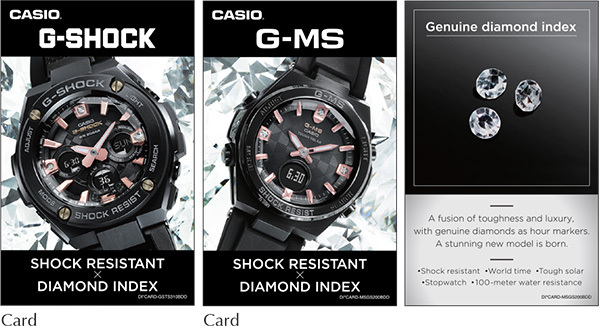 From the always-tough, always-rugged G-SHOCK and the BABY-G casual watch for active women come new diamond concept models. 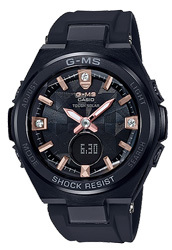 The two models that make up this paired combination are the popular G-STEEL and the G-MS. Diamonds embedded into the hour markers at 12, 3, and 9 o'clock give these models a look of class, and even the crystal of these models is cut to a diamond-like image. 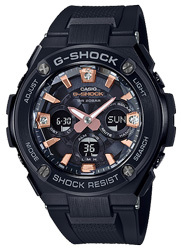 The basic black coloring of this pair is accented by the rose gold coloring of the hands and hour markers.